Heat oven to 375°F. Into 8-inch skillet, crumble sausage. Cook over medium-high heat, stirring frequently, until no longer pink; drain. If using crescent rolls: Unroll dough; separate into 4 rectangles. Place in ungreased 13x9-inch pan. Press over bottom and 1/2 inch up sides to form crust; firmly press perforations and edges to seal. If using dough sheet: Unroll dough. Place in ungreased 13x9-inch pan. Press over bottom and 1/2 inch up sides to form crust. 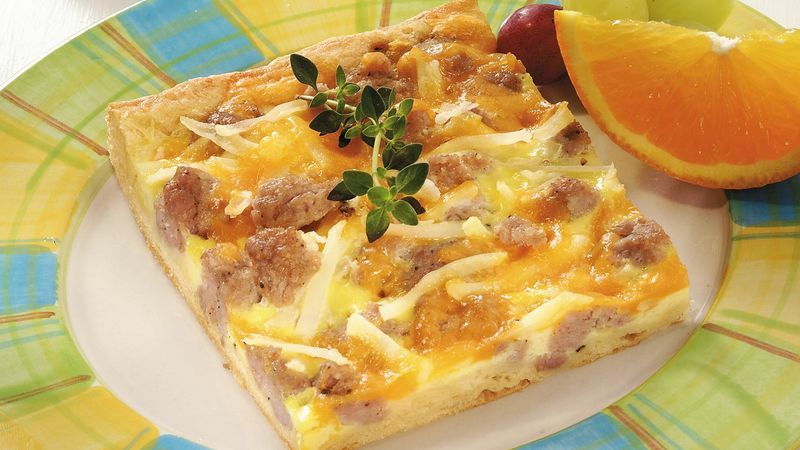 Spoon sausage evenly over crust. Sprinkle with potatoes and cheese. Beat eggs in medium bowl. Add remaining ingredients; mix well. Pour over cheese in crust. Bake 18 to 23 minutes or until center is set and edges are deep golden brown. If desired, serve with salsa. Cover and refrigerate any remaining pizza.